Because the Selectrix-Bus is not a 100% stable for large bus-lengths (~20m), I looked into alternatives which can easily be interfaced with the old SX-Bus. 1) the simplicity of the overall system: 112 channel 8 bit each, thats it! 3) LocoNet is not really on open system – there is a lot of documentation available, but reading the licence terms (even the one of the open source project „Arduino LocoNet library“) discouraged me. 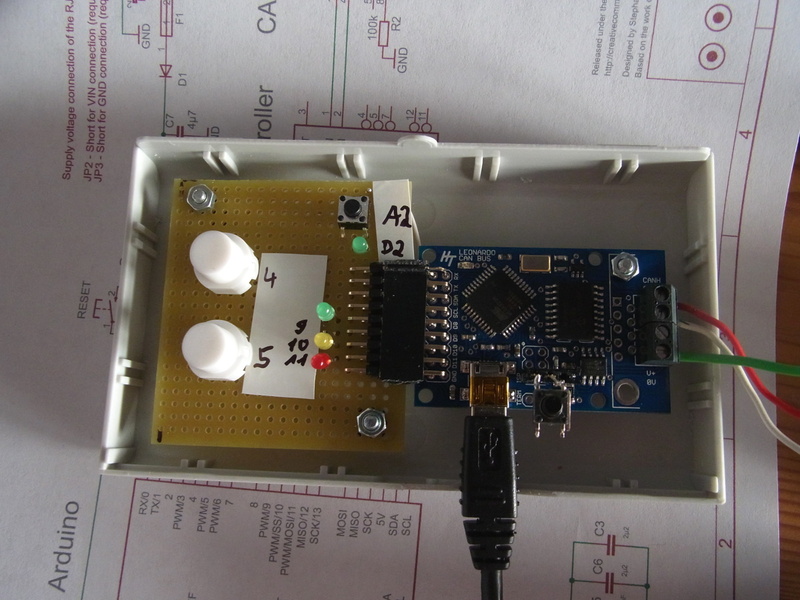 CBUS uses the CAN-BUS for transmitting its data, which is an excellent choice given the robustness of the CAN-BUS. There are the cheap interface chips available as well as interface boards and libraries for both the Aduino and the RaspberryPI. I’m a member of “MERG”, the (mainly) UK group who invented CBUS, therefor I had a look onto this system for some years now and have built some of the MERG modules. But I was always overwhelmed by the complexity of the system (including two modes of operation, SLIM and FLIM) – or maybe I just had not enough patience to really dive into this complexity – although I made my own Arduino “CBUS monitor”, see (oscale.net/cbus). In the meantime “amaurial” has made a nice Arduino lib, which makes building arduino based modules easier, but (just like the CBUS features) the library is pretty complex. Therefore in the end I decided to build a simple “Selectrix type” system (i.e. address based, 8bit based) which can use both Selectrix hardware (i.e. the old modules on our club layout) and newer CAN-bus connected modules. It is meant for small to medium size layouts (with a limited number of addresses). For each channel there are also “producers” like loco throttles or encoders connected to push button groups or a panel. OPC_SX_SET 0x31 SX-Channel SX-Data med. The MCP2551 CAN outputs will drive a minimum load of 45 Ω, allowing  a  maximum  of  112 nodes  to  be connected (given a  minimum differential input resistance of 20 kΩ  and a nominal termination resistor value of 120 Ω). 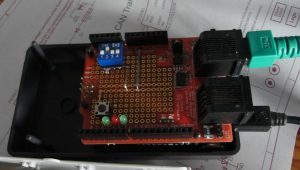 For the standard Arduino there are several CAN-Bus shields available – enough for making the first test setups. However, I wanted to have a test board similar to the Selectrix “Basis” boards (which utilize a compact Arduino Pro Mini) and found a nice CAN-Arduino at the hobbytronics shop in the UK. It is not much larger than the Arduino Pro Mini.